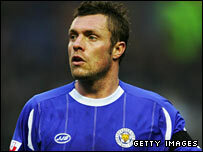 Scunthorpe have taken much-travelled striker Geoff Horsfield on loan from Sheffield United for the remainder of the season. The former Birmingham and Fulham striker has not featured for the Blades in the Championship this season but has played and scored in the Carling Cup. The 34-year-old joined the Blades for £1.2m in May 2006. As part of his loan, it has been agreed Horsfield will not play for Scunthorpe against the Blades on 9 February. Horsfield has made over 300 league appearances in a career that has seen him play for Halifax, Fulham, Birmingham, Wigan, Leeds, Leicester and West Bromwich Albion.